A consistent performer on the wine show circuit as it hails from a microclimate that is ideally suited to growing Chenin Blanc grapes with vibrancy and distinctive varietal characters. John Gehrig is a fourth generation winemaker, a descendant of Victoria's oldest winemaking family which settled in the late 1850s at Barnawartha at Victoria's northeast. From Chenin Blanc grown on the Gehrig family estate in Oxley along the King River which lies between Milawa and Glenrowan, a pure varietal wine with a full palate, exquisite balance and clean crisp finish. 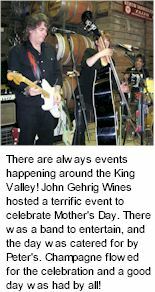 John Gehrig has a passion for winemaking that stretches over sixty years, he learned the craft from his father and established his own vineyard in 1976. The diversity of a pretty countryside with a range of undulating aspects and viticultural microclimates was the determining factor in settling on the King Valley. Gehrig's vineyard is lovingly maintained and ergonomically watered by a trickle irrigation system. A grafting programme has ensured that half of the vines are on their own roots, the other half grafted onto American root stock to offset the danger of phylloxera. The practical size of the vineyard allows for hand pruning and picking which is essential to the production of the highest quality wine. Light straw colour. Classic Chenin Blanc fruit characters are up front, with fresh apples, pears and orchard fruit on the nose. A mid weight palate with effusive varietal fruits, canteloupe, grasses and nut. Always a lively, generous wine with fresh full fruit flavours and a crisp, lingering finish. The perfect complement to seafood and spicy Asian dishes, John Gehrig can be enjoyed with a wide range of foods or as an aperitif to stimulate the appetite.